There are only a small handful of authors whose work I look for when I step into a bookstore and for whom I will purchase their newest work as soon as it is released. Philippa Dowding has just joined that small list. 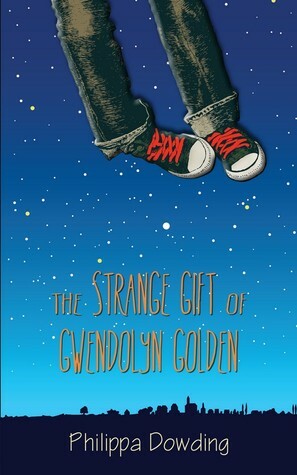 In The Strange Gift of Gwendolyn Golden, the recent-teen titular character starts the book by waking up on the ceiling, much to her own surprise and fear. She’s pretty sure that this is not normal behavior and later, when she begins to leave the ground again, she worries about floating away and never getting back to the ground again. She also worries about what the kids at school will think of her if they catch her floating. Most already think she’s an oddball because of her anger issues (ever since the death of her father). But someone does notice and gives Gwendolyn tips on ‘night flying’ which could be even stranger than the flying itself. And just as Gwendolyn faces some tough challenges with her new talent and overcomes them through determination – finding it within herself – so too she finds it within herself to face some of the other challenges that life has thrown at her. This is one of the most beautiful coming-of-age stories I have ever read. For a time I wasn’t sure if Gwendolyn’s flight ability was ‘real’ or something she was imagining as an escape mechanism for the other troubles she was facing. The fact that it was real (in the world of the story) made the allegory and metaphor tremendously powerful and heart-warming. I was going to refer to Philippa Dowding as ‘a female Neil Gaiman’ but then wondered if maybe Neil Gaiman wasn’t a male Philippa Dowding? Then I decided that there was no need for the gender comparisons. Dowding, like Gaiman, writes extremely powerful stories with characters that could be you or me or someone we know quite well and interact in a magical world that should be real or at the very least, feels very real. This story has a hint of darkness, just as the world that a teen is growing in to can be dark, but Dowding takes the positive view that it is within the character to face the challenges and push away the darkness. Even the titles has multiple layers to it. On quickly reading this title and then the book, one would assume the title refers to Gwen’s flying. But the title refers to the gift OF Gwendolyn Golden – a teen who doesn’t have many friends and is an outcast. How can she be a gift? To whom? I wish every fifth-to-ninth-grade student would read this – it encourages a world of possibilities, which is as it should be. Looking for a good book? This is it. The Strange Gift of Gwendolyn Golden by Philippa Dowding is a fantastic, creative coming of age story that is sure to delight.